The Beard Team USA Blog: Passion! The new world champion in the full beard natural category is BTUSA's Jack Passion who won his title at the World Beard and Moustache Championships in Brighton, England, on September 1, 2007. Well done Jack and all! It was really cool to meet with Jack at the Apple Store Regent Street before heading down to Brighton. Good job! Fantastic - and what a beautiful beard! We had a fantastic day at the event, and as locals we were delighted to have the event in our home town. We thought Jack's beard was the best - and he certainly deserved to win. Well done Jack. Congratulations to Jack, Kenny and David and all of BTUSA! What an outstanding showing. I am proud to be your bearded brother! I am looking forward to joining you all in Anchorage in 2009! i went to the championships yesterday and had the greatest time. me and my sister got to meet with jack and his beard was just beautiful. We felt quite inadequate not being able to grow our own! congratulations jack! Congradulations Jack! 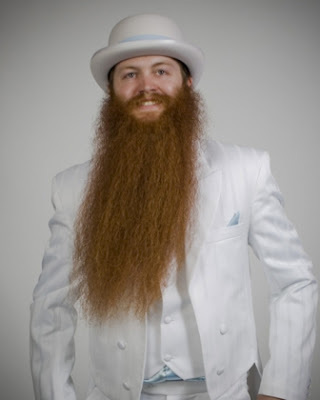 Great Beard Bro, Your suit really made the great white hope stand out in the crowd. Way to go BTUSA! Congratulations Jack! I'm happy to see so many USA winners in many of the categories! Great job guys! Congrats Jack! We all knew you would be famous someday, we just didn't know it'd be for this! Will meet you in Alaska in 2009. Great collection of beards and moustaches. Great work Jack, you've got many great years ahead. It was a delight to meet such a perfect gentleman who relishes his facial furniture.